There are a wide variety of specialties available to WordPress professionals, including development, design, marketing, content creation, and more. However, the narrower the scope of your services is, the more limited your pool of potential clients becomes. In this article, we’ll share the results of our 2019 WordPress Maintenance Survey. As promised, we’ll include concrete data on the website maintenance services our users offer, and discuss some key takeaways from the survey’s results. Here we go! Once again, we’ve surveyed ManageWP users on the website maintenance services they offer to clients. A total of 2,374 WordPress professionals participated, 487 of which came from Pro Sites. This is a huge increase in participation since our 2016 website maintenance survey! 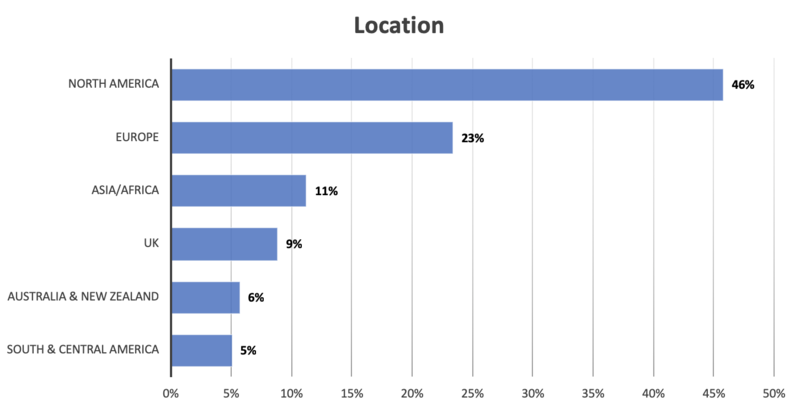 Most of survey participants were from North America (46%), with another 23% from Europe (31% if we include the UK) and the rest coming from all over the globe (from over 100 different countries in fact). The results that follow will help to explain why this finding is important. However, in short, it means that more than a quarter of our customers aren’t using the best pricing method available for promoting their services. 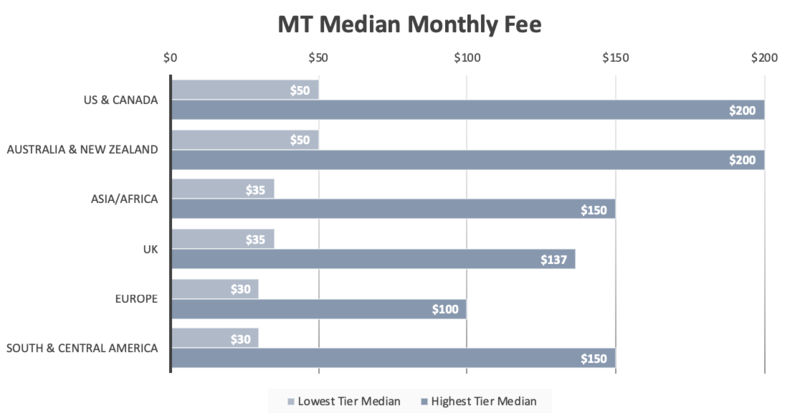 As you can see from this chart, most of our participants who offer only one tier charge about $50 per month. 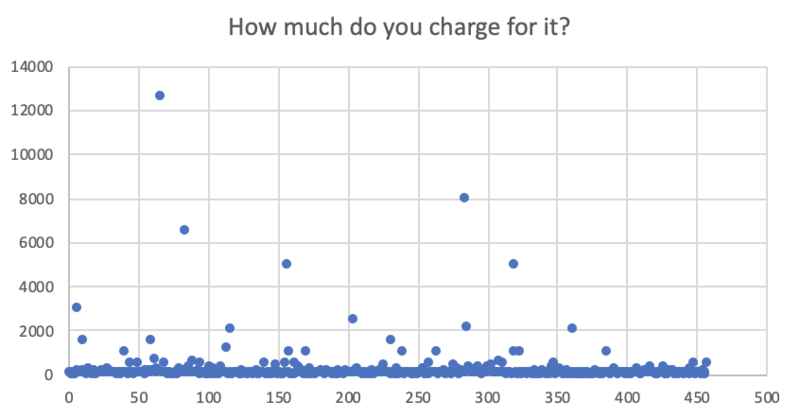 However, a few charge significantly more, making the average more than triple the median. 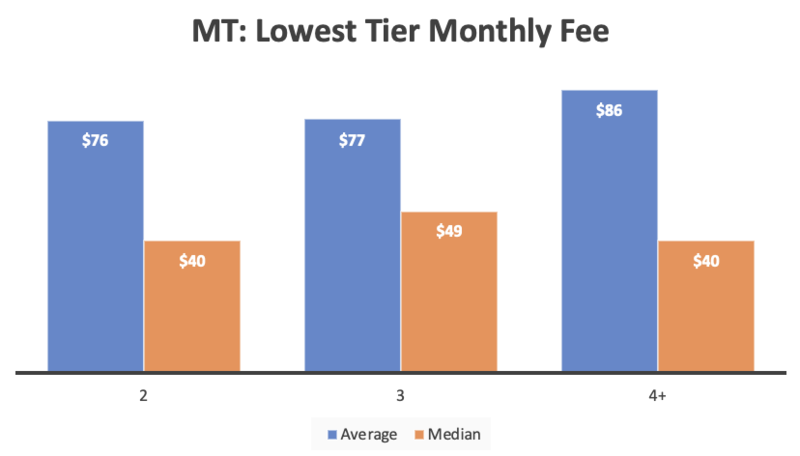 Since the single tier monthly fees vary greatly, they significantly impact average figures. We will focus on determining the median as a more reliable measure for comparisons. 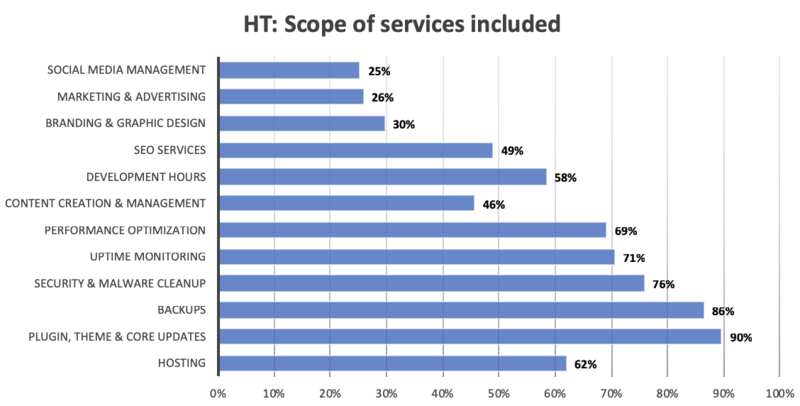 As you can see, almost three-quarters of those who offer only one tier of services have 20 clients or fewer. Most of those serve between six and 20 clients. 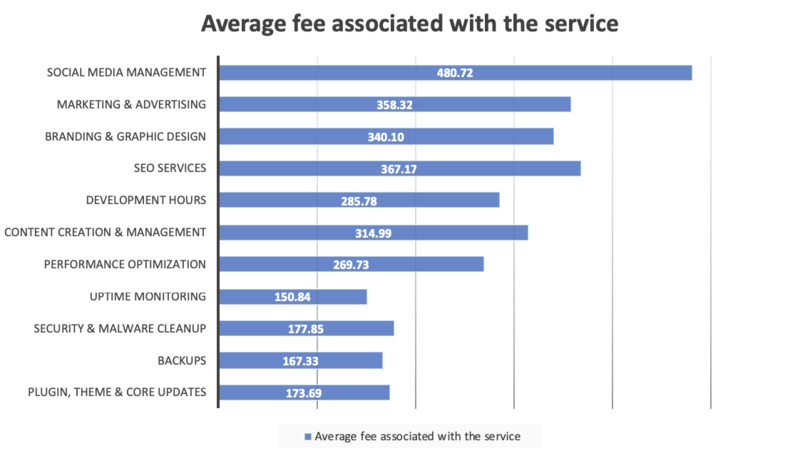 To be completely clear, graph above shows how specific services raise the average monthly fee if they are included in the package. Tapping into markets for social media management and SEO services could enable these participants to raise their prices and improve their income. Just under half offer three tiers, which in our experience is a strong pricing strategy. 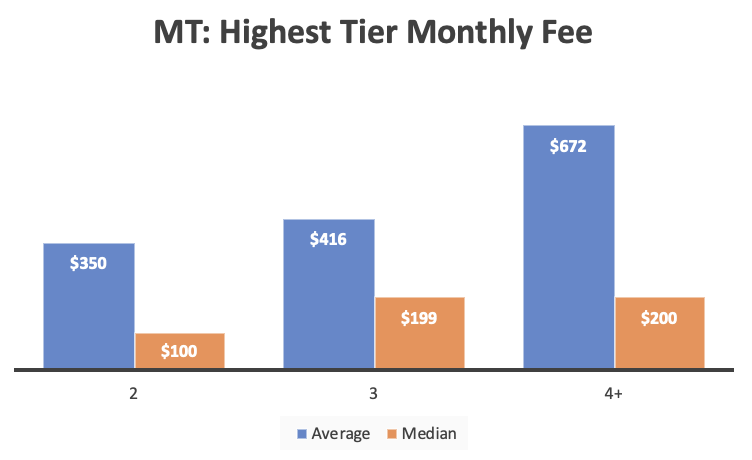 Here, we can see that the fees increase as the number of tiers grows. 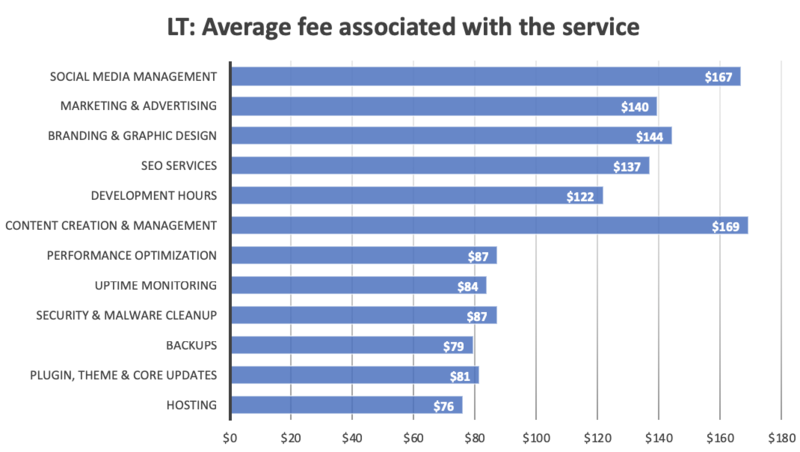 From this information, it’s easy to conclude that the more tiers you offer clients, the easier it is to up-sell them to a more valuable service. 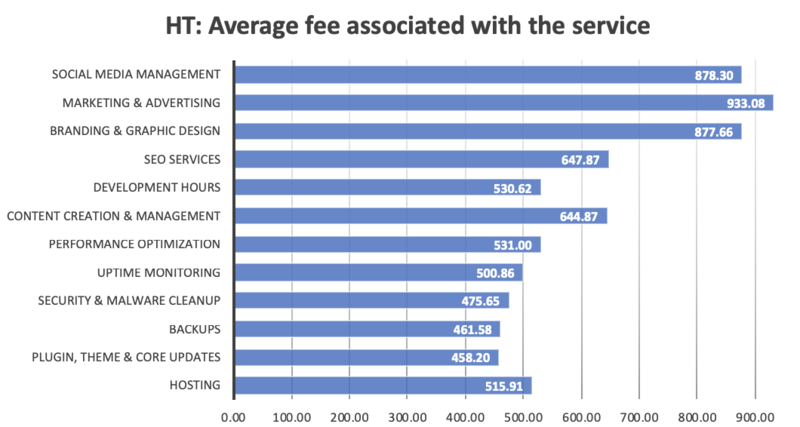 While Oceania and North America are still the most lucrative locations, Europe’s average fee drops significantly when compared to single-tier services. Results for monthly fees in Asia/Africa, South and Central America should be taken with ‘a grain of salt’ due to the low number of answers. 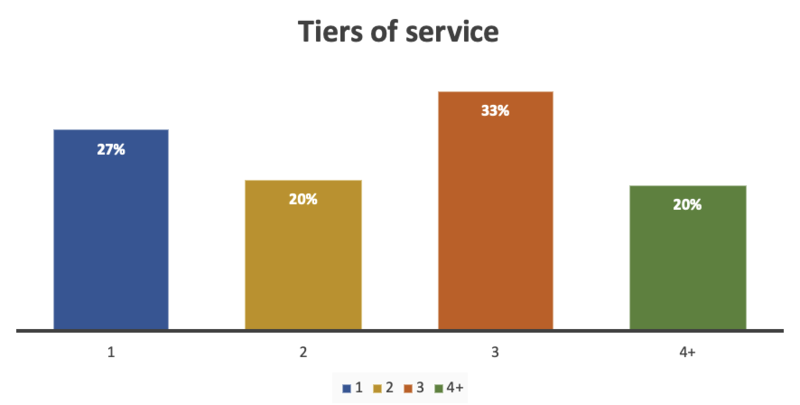 42% of those offering multiple tiers of service have between six and 20 clients, which is almost identical to the results for single tier services. 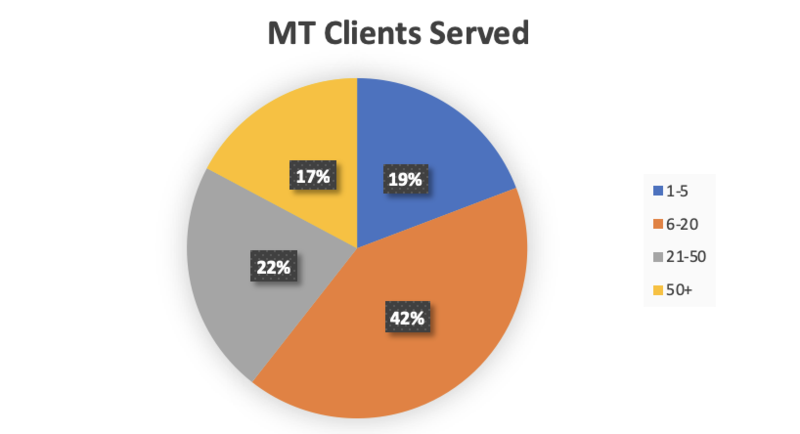 However, the portion of participants with only one to five clients drops by a significant 12%, meaning that those who offer multiple tiers are more likely to have over 20 clients. As you can see from all of these results, those who offer multiple service tiers tend to be better equipped to generate greater income. That’s because they serve more clients, charge higher fees, and have the ability to up-sell more lucrative tiers. Data is important, but what matters most is how you use it. 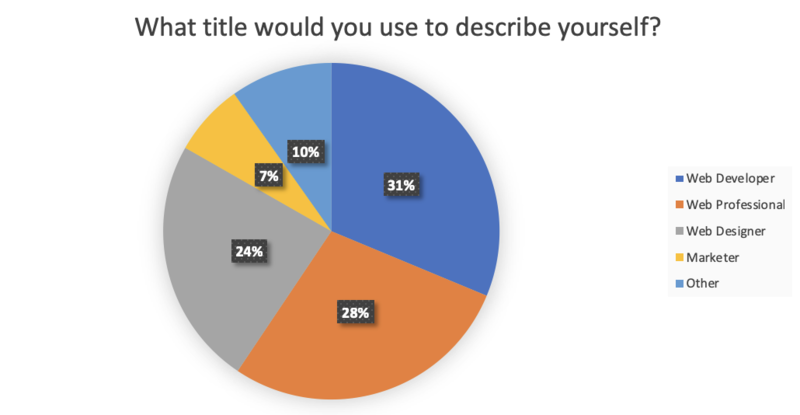 With that in mind, let’s look at some key takeaways from our 2019 WordPress Website Maintenance Survey, which you can apply to your own services. As we saw at the beginning of this article, 95% of our survey’s participants offer website maintenance services. Therefore, if you don’t offer to maintain clients’ sites in some way, your business will be less competitive. You’re also likely to miss out on opportunities for highly-profitable work. Let’s imagine that you offer a typical single-tier maintenance service. You’ll probably have 6-20 clients, and charge about $50 per month. That’s an additional $300-$1,000 per month in your bank account. If you offer three tiers, have 6-20 clients evenly distributed throughout them, and charge $49, $99, and $199 per month for each tier, you could bring in $694-$2,330 per month. Plus, the more services you offer, the larger your pool of potential clients is. Offering uncommon services such as social media management could make your business more desirable. As you can see from the example above, offering multiple tiers could easily double your income from maintenance services. This is in part due to the three-pronged pricing technique. This technique demonstrates that, by offering multiple tiers, you can encourage customers to spend more to get more. You can also convince customers in the lower tiers to upgrade, as you gain their trust and loyalty over time. In addition, don’t forget that more customers are attracted to multi-tier services. 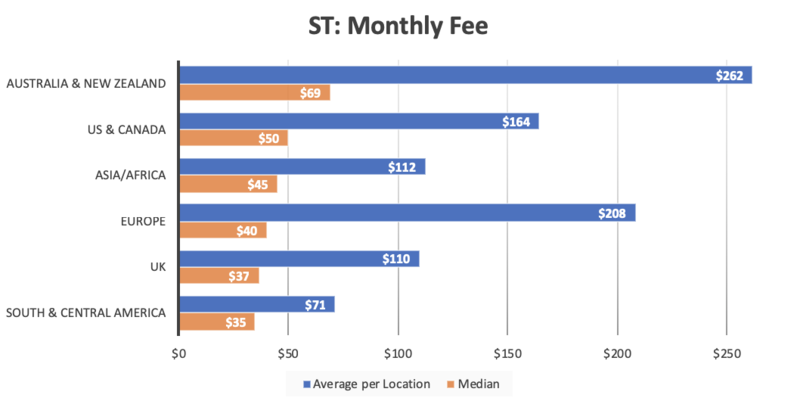 Plus, average lowest-tier fees are usually comparable to single-tier fees. This means you can still make more by offering multiple tiers, even if very few customers choose your more expensive packages. If you’ve been looking over the data we’ve shared and think it’s intriguing, but you don’t have time to take on website maintenance, there’s good news. Maintaining your clients’ sites will take almost no time at all if you automate key maintenance tasks. With ManageWP, you can automate almost all of that work for both yourself and your clients. The ManageWP dashboard enables you to manage all of your sites at once, making updates and backups a breeze. You can also monitor performance, SEO, security, and comments. You can also find tools to automate social media management, which as we’ve shown is a key under-served market you may want to target. Plugins such as Blog2Social can schedule blog and social posts for you. You could also look into platforms such as Hootsuite, which schedules posts, provides analytics, and helps curate content. As our survey results demonstrate, website maintenance is still a highly-profitable service WordPress professionals can offer. For ManageWP users, the benefits of providing maintenance services to clients are even greater, as you can easily automate many of the tasks associated with maintaining a site. 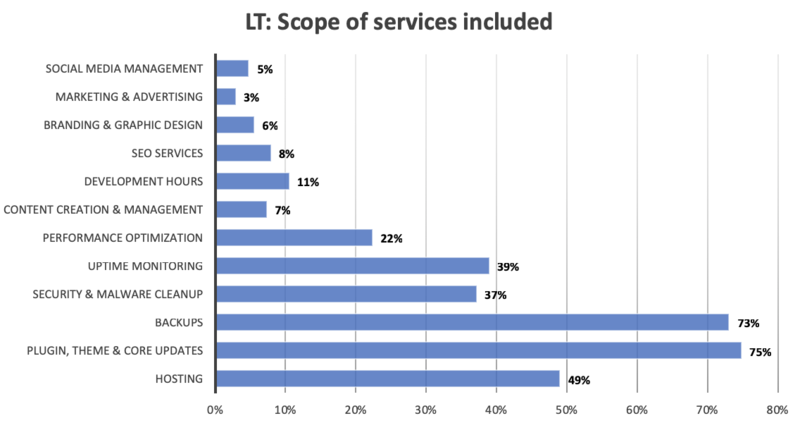 Our 2019 WordPress Website Maintenance Survey also shows that offering multiple tiers is still the best way to go when it comes to pricing your services. Pairing this technique with the features we offer can help you make more money, with minimal effort required. Do you have any questions about offering WordPress website maintenance services? Let us know in the comments section below! Indeed a great article to justify that website maintenance is still a highly-profitable service and also as from client side it is like an investment. Just like a car needs regular servicing, the website also depends on ongoing maintenance to ensure it is always ready to deliver a great user experience to visitors and generate maximum leads and sales for the business. So website maintenance is a two-way profitable business.